How about a visit to the Oldest Bar in America! “We’re often asked where the oldest bar in America is found. Those that are into bars might remark that it’s one of a handful around the country, like the Bell in Hand in Boston, or Laffite’s Blacksmith Shop in New Orleans. Both are wrong: the building housing Lafitte’s is from 1722, but there’s no proof the bar has always been there, and the Bell in Hand opened in the 1800’s using the name of a different bar opened in Boston’s Pi Alley around 1795. 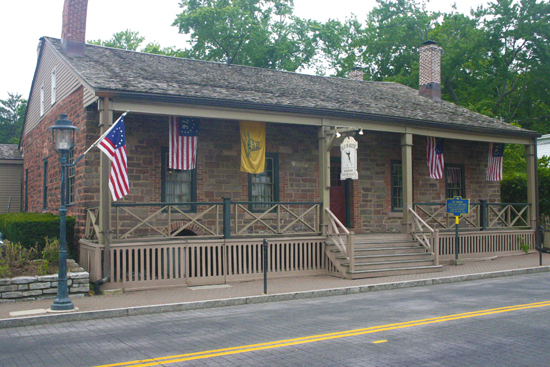 The oldest bar in America is actually just north of New York City in the small town of Tappan, New York, and it’s called the Old ’76 House (sometimes just ’76 House). It doesn’t look like much: a small, stone building sporting a number of chimneys and just down the street from the Reformed Church of Tappan, another old structure important in its own ways. But though modest looking, the place is incredibly rich in history. The Old ’76 House was built in 1686 by the Dutch Immigrants who founded Tappan. It was established as the town’s Public House as a means to gain a land patent (official recognition as a colony) by the Dutch government. In that time to be recognized as a settlement, whether in Europe or the New World, a town had to have a place to host travelers, receive mail and hold meetings. In other words, it had to have a Public House.